Schuman is an excellent writer and a skilled artist, creating a visually stunning and fun story for children aged 6-10. A little boy (very little) lives in the woods but has no friends and not much knowledge about woodland life. 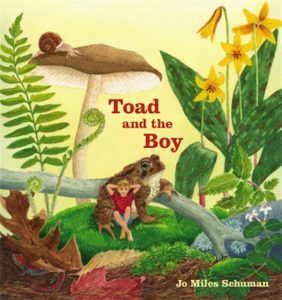 Boy meets a variety of creatures (turtle, barn swallow, snake), but his best friend is Toad, a wise, cheerful fellow who teaches Boy how to live in the woods — what to eat, what to avoid and how to distinguish between him being somebody else’s lunch or they being his. Boy flies with the swallow, wrestles playfully with the snake and rides on Toad’s back. When Toad falls into a well and can’t get out, Boy figures out a clever way to rescue his good friend, saving Toad’s life and cementing their friendship. Several valuable lessons appear: To have friends, you must be a friend, and friends will always help each other. Schuman also adds a smart index to help children find and identify other insects and animals hidden in the illustrations. With perhaps a slight nod to Ernest Hemingway, Jean Flahive’s latest children’s book is a tender tale about an old fisherman and a porpoise, with a comfortable, happy ending. 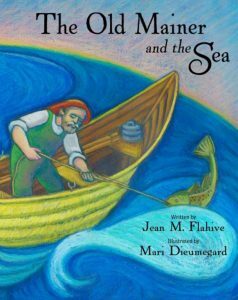 “The Old Mainer and the Sea” is beautifully illustrated by Standish artist Mari Dieumegard, using oils and pastels, and the story is warm and exciting, for children aged 4-8. Old fisherman Eben rows his yellow dory from Chebeague Island to Portland to sell his catch. On the way, he fishes for cod as he rows. One day he’s startled to find a harbor porpoise caught in his lines and hooks. Eben gently frees the frightened porpoise, just as a thick fog bank rolls in. Eben can’t see through the fog, becomes disoriented, and is nearly wrecked by a passing schooner. Adrift in the fog, Eben now is scared. But the harbor porpoise returns and guides Eben to shore and safety, saving his life. The moral: Kindness is always returned, some way, some time. Everybody loves a story about a puppy, and this one is simply charming. Author Michelle Patch lives on Thomas Pond, near Raymond, and this is her first children’s book. Award-winning artist Thomas Block illustrates the story with colorful, detailed artwork. 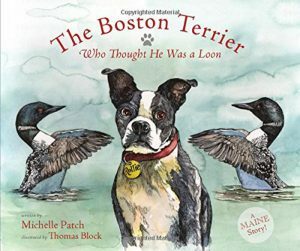 This is a fun and funny tale, for children aged 6-10, about Rollie, a Boston terrier puppy who is so playful, energetic and friendly. He makes friends with everyone. Rollie is also unusual — most Boston terriers do not like water, but Rollie loves to swim in the pond. While playing on the shore one day, Rollie sees a loon in the water. He sees that the loon has the same black and white coloring and loves to swim, so Rollie thinks he is a loon, too. He jumps into the pond to play with the loon. Later, while riding on the family’s pontoon boat, Rollie sees more loons, so he jumps into the water to play. They play the summer away. Winter comes and goes, and by springtime Rollie and his loon pals are reunited at the pond, ready to play again.